Hard to imagine that he and I agree on something. It's no secret that I hate the TSA - I have called for an end to the TSA at least three separate times on this blog in just the past 6 months. Now, it seems that the TSA has managed the impossible. The TSA has caused Rand Paul and me to agree on something - which is quite a feat, since I think Rand Paul is a juvenile Ayn Rand devotee who is wrong on practically every policy issue that exists. 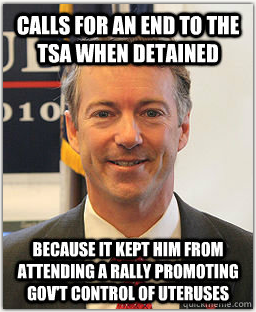 Yesterday, Rand Paul revealed that his reform plan for the TSA is to scrap the agency completely. His solution is to re-privatize airport security. I don't know if that's the best solution, but I do know that the current way the TSA is unsustainable and endangers Americans' security. Rand Paul was detained by the TSA back in January, which caused him to miss a scheduled speech at a March for Life rally in Washington, DC. So, you could say that government intrusion prevented him from promoting ... a different kind of government intrusion. But, still, in spite of the fact that I disagree with practically everything Rand Paul stands for, it's good to see that existential hatred for the TSA crosses all political boundaries - maybe that means something will actually happen to fix the TSA's destructive effect on American liberties, sooner or later. For more funny/insightful banter about Rand Paul's plan, head over to Slashdot. Labels: Apocalypse, Justice, Politics, U.S. If it helps, I can think of a difference between you and Sen. Paul. Suppose President Obama shut down the TSA, and later a terrorist attack with an airplane took place. You (and I) would grieve for the victims, but count that as the price of freedom. Sen. Paul would be denouncing the President's irresponsibility before the EMTs even got to the scene.